The multibandParametricEQ System object™ performs multiband parametric equalization independently across each channel of input using specified center frequencies, gains, and quality factors. You can configure the System object with up to 10 bands. You can add low-shelf and high-shelf filters, as well as highpass (low-cut) and lowpass (high-cut) filters. Create the multibandParametricEQ object and set its properties. mPEQ = multibandParametricEQ creates a System object, mPEQ, that performs multiband parametric equalization. mPEQ = multibandParametricEQ(Name,Value) sets each construction argument or property Name to the specified Value. Unspecified properties and creation arguments have default values. Example: mPEQ = multibandParametricEQ('NumEQBands',3,'Frequencies',[300,1200,5000]) creates a multiband parametric equalizer System object, mPEQ, with NumEQBands set to 3 and the Frequencies property set to [300,1200,5000]. The value specified by NumEQBands must be the length of the row vectors specified by Frequencies, QualityFactors, and PeakGains. During creation of the System object, the first property you specify locks the value. Creation arguments are properties which are set during creation of the System object and cannot be modified later. If you do not explicitly set a creation argument value, the property takes a default value. Number of equalizer bands, specified as an integer in the range [1, 10]. The number of equalizer bands does not include shelving filters, highpass filters, or lowpass filters. NumEQBands is set during creation of the System object and cannot be modified later. If you do not explicitly set its value, the property takes the default value. Example: mPEQ = multibandParametricEQ('NumEQBands',5) creates a multiband parametric equalizer with 5 bands. Order of individual equalizer bands, specified as an even integer. All equalizer bands have the same order. EQOrder is set during creation of the System object and cannot be modified later. If you do not explicitly set its value, the property takes the default value. Example: mPEQ = multibandParametricEQ('EQOrder',6) creates a multiband parametric equalizer with the default 3 bands, all of order 6. Low-shelf filter toggle, specified as false or true. false –– Do not enable low-shelf filtering in multiband parametric equalizer implementation. true –– Enable low-shelf filtering in multiband parametric equalizer implementation. HasLowShelfFilter is set during creation of the System object and cannot be modified later. If you do not explicitly set its value, the property takes the default value. Example: mPEQ = multibandParametricEQ('HasLowShelfFilter',true) creates a default multiband parametric equalizer with low-shelf filtering enabled. High-shelf filter toggle, specified as false or true. false –– Do not enable high-shelf filtering in multiband parametric equalizer implementation. true –– Enable high-shelf filtering in multiband parametric equalizer implementation. HasHighShelfFilter is set during creation of the System object and cannot be modified later. If you do not explicitly set its value, the property takes the default value. Example: mPEQ = multibandParametricEQ('HasHighShelfFilter',true) creates a default multiband parametric equalizer with high-shelf filtering enabled. Lowpass filter toggle, specified as false or true. false –– Do not enable lowpass filtering in multiband parametric equalizer implementation. true –– Enable lowpass filtering in multiband parametric equalizer implementation. HasLowpassFilter is set during creation of the System object and cannot be modified later. If you do not explicitly set its value, the property takes the default value. Example: mPEQ = multibandParametricEQ('HasLowpassFilter',true) creates a default multiband parametric equalizer with lowpass filtering enabled. Highpass filter toggle, specified as false or true. false –– Do not enable highpass filtering in multiband parametric equalizer implementation. true –– Enable highpass filtering in multiband parametric equalizer implementation. HasHighpassFilter is set during creation of the System object and cannot be modified later. If you do not explicitly set its value, the property takes the default value. Example: mPEQ = multibandParametricEQ('HasHighpassFilter',true) creates a default multiband parametric equalizer with highpass filtering enabled. Oversample toggle, specified as false or true. false –– Runs the multiband parametric equalizer at the input sample rate. true –– Runs the multiband parametric equalizer at two times the input sample rate. Oversampling minimizes the frequency-warping effects introduced by the bilinear transformation. A halfband interpolator implements oversampling before equalization. A halfband decimator reduces the sample rate back to the input sampling rate after equalization. Oversample is set during creation of the System object and cannot be modified later. If you do not explicitly set its value, the property takes the default value. Example: mPEQ = multibandParametricEQ('Oversample',true) creates a default multiband parametric equalizer with oversampling enabled. Center frequencies of equalizer bands in Hz, specified as a row vector of length NumEQBands. The vector consists of real scalars in the range 0 to SampleRate/2. Quality factors of equalizer bands, specified as a row vector of length NumEQBands. The vector consists of real scalars in the range [0.2, 700]. Any values outside the range are saturated. Peak or dip filter gains in dB, specified as a row vector of length NumEQBands. The vector consists of real scalars in the range [–inf, 20]. Values above 20 are saturated. Low-shelf filter cutoff in Hz, specified as a scalar greater than or equal to 0. To enable this property, set HasLowShelfFilter to true during creation. Low-shelf filter slope coefficient, specified as a real scalar in the range [0.1, 5]. Values outside the range are saturated. Low-shelf filter gain in dB, specified as a real scalar in the range [–12, 12]. Values outside the range are saturated. High-shelf filter cutoff in Hz, specified as a real scalar greater than or equal to 0. To enable this property, set HasHighShelfFilter to true during creation. High-shelf filter slope coefficient, specified as a real scalar in the range [0.1, 5]. Values outside the range are saturated. High-shelf filter gain in dB, specified as a real scalar in the range [–12, 12]. Values outside the range are saturated. Lowpass filter cutoff frequency in Hz, specified as a real scalar greater than or equal to 0. To enable this property, set HasLowpassFilter to true during creation. Lowpass filter slope in dB/octave, specified as a real scalar in the range [0:6:48]. Values that are not multiples of 6 are rounded to the nearest multiple of 6. Highpass filter cutoff in Hz, specified as a real scalar greater than or equal to 0. To enable this property, set HasHighpassFilter to true during creation. Highpass filter slope in dB/octave, specified as a real scalar in the range [0:6:48]. Values that are not multiples of 6 are rounded to the nearest multiple of 6.
audioOut = mPEQ(audioIn) performs multiband parametric equalization on the input signal, audioIn, and returns the filtered signal, audioOut. The type of equalization is specified by the algorithm and properties of the multibandParametricEQ System object, mPEQ. Audio input to the equalizer, specified as a matrix. The columns of the matrix are treated as independent audio channels. Audio output from the equalizer, returned as a matrix the same size as audioIn. Create dsp.AudioFileReader and audioDeviceWriter System objects™. Use the sample rate of the reader as the sample rate of the writer. Call setup to reduce the computational load of initialization in an audio stream loop. Construct a three-band parametric equalizer with a high-shelf filter. Visualize the magnitude frequency response of your multiband parametric equalizer. Play the equalized audio signal. Update the peak gains of your equalizer band to hear the effect of the equalizer and visualize the changing magnitude response. 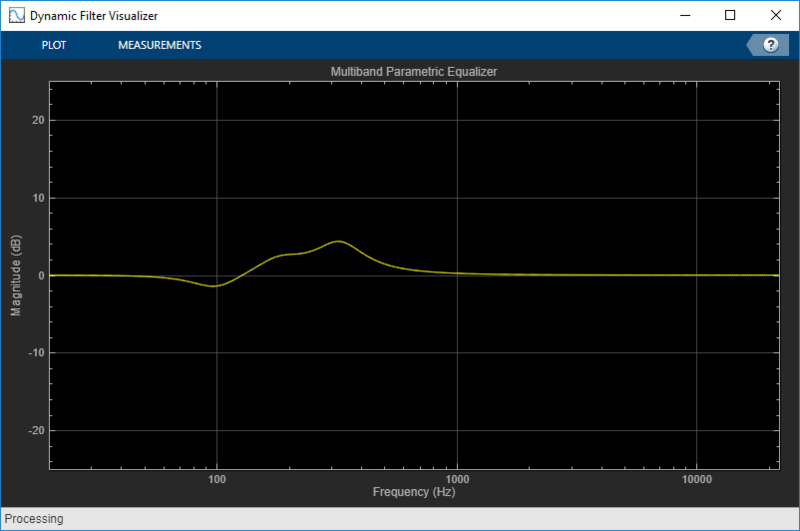 Reduce warping by specifying your multibandParametricEQ System object™ to perform oversampling before equalization. Create a one-band equalizer. Visualize the equalizer band as its center frequency approaches the Nyquist rate. The equalizer band is warped. Create a one-band equalizer with Oversample set to true. Visualize the equalizer band as its center frequency approaches the Nyquist rate. Create a dsp.AudioFileReader to read in audio frame-by-frame. Create a audioDeviceWriter to write audio to your sound card. Create a multibandParametricEQ to process the audio data. Call visualize to plot the frequency response of the equalizer.